It’s Sunday, it’s brunch time.. or close enough. I love brunch, any excuse to eat a mix of two meals as one. If I can’t get out, most of the time (especially on a Sunday) I can’t be bothered to get dress and leave the house to head to a cafe or restaurant, so I whip up hearty and simple dishes like this. 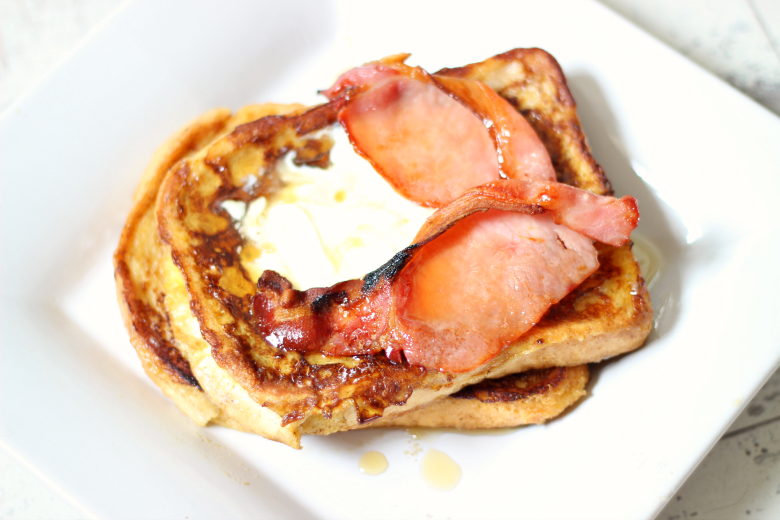 French toast is such a simple and utterly delicious treat and can be topped with anything you fancy from fruit to clotted or even ice cream. Who doesn’t love something sweet and filling to eat?! 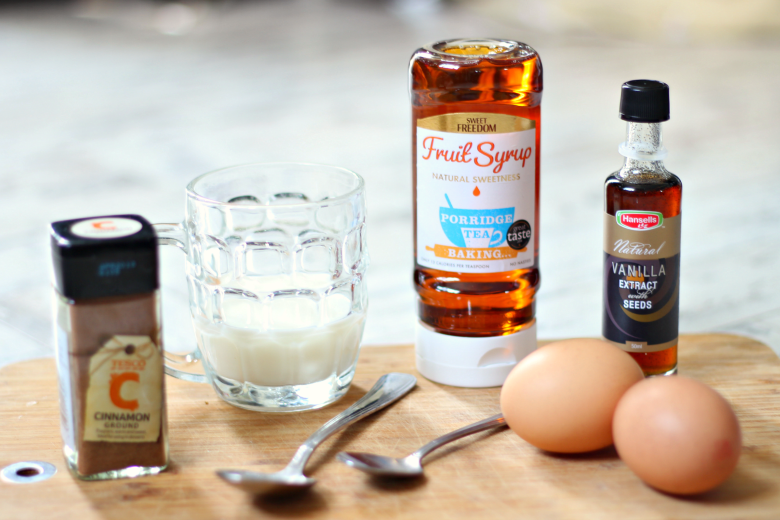 I’ve been trying out this fruit syrup from Sweet Freedom*. It’s a 100% natural fruit syrup (completely suitable for Vegans!) with just 13 calories per teaspoon and can be used in just about anything from teas and coffees to porridge and even in baking. It makes a perfect replacement for sugar and you can use 50% less than standard sugar and honey due to it’s naturally rich and sweet taste. If you’re having any hot toppings like bacon, prep and cook that now as the French toast doesn’t take long. Place soaked bread into the pan. Cook on one side until golden. Try not to squash the toast down, you’ll want it light and fluffy! When this side has reached golden, turn over and repeat until cooked through. Add more butter/oil spray to the pan and repeat for second slice of bread. Serve warm with desired toppings of choice. Et voila.. delicious brunch cooked and ready within minutes without having to leave the house! I love how light and fluffy the toast is inside with the delicious sweet crunch on the outside. Make sure you’re using a nice thick slice of bread or you may find it will fall apart after soaking in the egg mixture. Hovis Doorstep Loaf or even an unsliced loaf to slice yourself are the best options. I topped mine with natural yoghurt whipped up with a dash of cinnamon and smoked bacon, which I drizzled with Sweet Freedom Fruit Syrup to add a little sweetness. Do you like French toast? What’s your favourite brunch menu item? Give me some ideas for my next brunch post! I used to make French Toast all the time but I haven’t had it in ages. 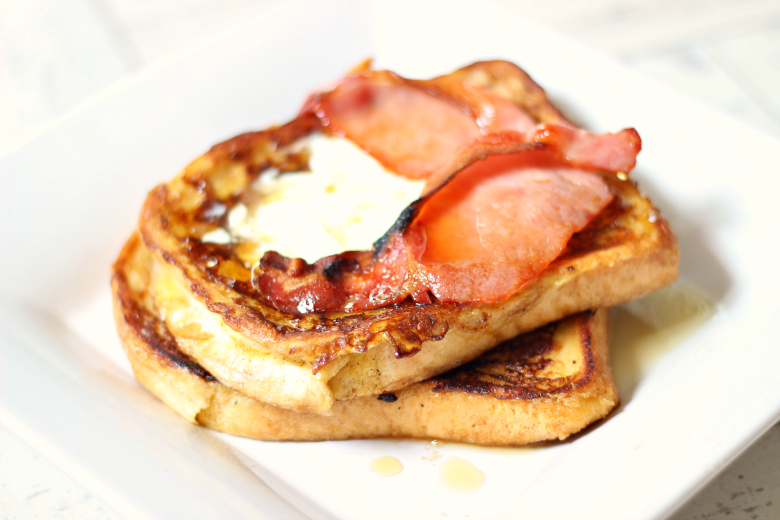 Bacon is definitely my favourite topping – I might have to bring this back into my brunches!